The earliest, best-documented account of when Chinese began to arrive in the United States comes from the memoirs of an intellectual named Yung Wing. Yung was a student under the sponsorship of American Christian missionaries and went to Hartford, Connecticut, in 1847 to further his studies. Yung eventually graduated from Yale University and married an American woman. They had two children, who also attended Yale. Yung worked with the Qing administration to set up a program that eventually sponsored an additional 120 male Chinese students to study in Hartford as part of a government reform effort. Wing also lobbied against the Chinese Exclusion Act of 1882, which only the states of Massachusetts and Connecticut did not ratify. 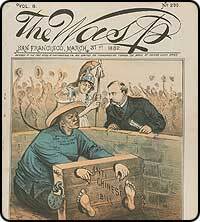 A political cartoon from The San Francisco Wasp advocating for the Chinese Exclusion Law, 1882. Meaningful immigration from China occurred during the California Gold Rush. People came from all directions to seek their fortunes after the news spread of gold being discovered at Sutter's Mill in 1848. It is estimated that some 25,000 Chinese arrived in California from 1849 to 1851. Chinese laborers also found work in the railroad, lumber and agricultural industries. They came through entry portals up and down the West Coast, from Vancouver to southern California. They also came through labor networks that had routed them into Mexico and Cuba. The overwhelming majority of the laborers were men, and as their numbers grew, they quickly set up networks of supporting enterprises in urban centers and towns across the West. As the West boomed, however, competition for jobs increased, and economic depression ensued by the early 1870s. Chinese laborers faced increasing discrimination and persecution by other ethnic labor groups. The Chinese were willing to work for lower wages, which pitted them against various interest groups, from those who were seeking to build labor unions to those who felt that America was only for Europeans to those who were against foreigners of any sort. The persecution was often violent, including total destruction of property, and sometimes deadly. And the economic depression of the early 1870s fueled the enmities. By 1882, the interest groups successfully won passage of the Chinese Exclusion Act, which prevented Chinese laborers from entering the country altogether. The Exclusion Act also prevented immigrants who were already in the country from being allowed to bring their wives or children. Merchants, diplomats, students, and all who could prove they were the son or daughter of an American citizen were exempted. The Exclusion Act was renewed in 1892 and made permanent in 1902, not to be undone until the 1943 Immigration Act instated new regulations across the board for all immigrants. The 1906 San Francisco earthquake destroyed the immigration records for the Chinese in California. There was no way for anyone to know who was or was not a legitimate citizen under the existing laws. Suddenly and serendipitously, many Chinese could get around the laws of the Exclusion Act and claim their right to be in the country. Furthermore, this allowed people to bring over spouses, sons and daughters, which led to the "paper sons" and "paper daughters" phenomenon. The Angel Island Immigration Station operated from 1910 to 1940, and, like Ellis Island for the East Coast, it became the symbolic portal for West Coast entry into the United States. Unlike Ellis Island, however, its message was one of discriminatory exclusion rather than of welcome. In response to domestic labor interests, immigration laws became increasingly restrictive, barring entry to Asian immigrant workers from China, India and the Philippines. Hopeful Chinese immigrants, legitimate or not, were held at Angel Island for lengthy periods of time -- a few months to more than a year -- and subjected to grueling, repetitive interrogations before given passage or deported. These detainees authored many poems, which they carved into and wrote all over the immigration station's walls. California park ranger Alex Weiss discovered the writings and carvings in 1970. After enduring decades of discrimination, the negative image of Chinese in the American consciousness began to change in 1930s and 1940s. Pearl S. Buck's The Good Earth (1932) portrayed the Chinese as long-suffering, sturdy peasants. Hollywood made a movie from it starring Katherine Hepburn. Meanwhile, China's resistance against Japanese imperialism and the elegance of Madame Chiang's appeals won widespread admiration. After Japan bombed Pearl Harbor and the United States joined the war effort, the two nations officially became allies. Richard J. Walsh, husband of Pearl Buck and a New York publisher, headed the Citizens Committee to Repeal Chinese Exclusion and Place Immigration on a Quota Basis, which formed in 1943 and drew members from a wide spectrum of the upper class and intellectuals. The group was instrumental in arguing for the Exclusion Act's repeal as both an issue of equal treatment on principal and as a protection for labor interests -- that cooperation from China could be gained to assist in curbing illegal immigration if only there was not such total and broad exclusion, as the act currently mandated. Furthermore, there had been a key international relations shift, which led to a public opinion shift. World War II had produced widespread anti-Japanese sentiment and support for Japanese American internment while elevating the plight of the Chinese in their fight against imperialism and totalitarianism. Roosevelt, in supporting passage of the new immigration allowance for Chinese, declared, "While it would give the Chinese a preferred status over certain other Oriental people, their great contribution to the cause of decency and freedom entitles them to such preference." Attempts were made to address family reunification and allow wives of Chinese American citizens to enter, but this would have to wait until 1965.